Yes! I want to makes a difference in the lives of hundreds of future Jewish leaders! Please remember that we depend entirely on funds provided by generous partners like yourself. We are not supported by any central office. 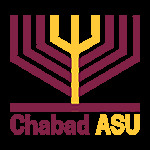 Every dollar of every donation is used directly for Jewish life at ASU. For additional sponsorship opportunities or to sponsor a student for the Holidays, please click here to contact Rabbi Shmuel or call (480) 736 8672. Please charge the above amount to my debit/credit card each month.